The Hallowsphere was both the primary Halloween event for 2015 and the series of subforums in which it took place. The Hallowsphere was controlled by Phanto and consisted of three layers: Shallow, Medial, and Deep. The first person to correctly enter the final password and enter the Deep Hallowsphere would be awarded a golden skull badge. Everyone else who entered it will receive a normal skull badge. Despite the event being over and placed in Archives, the Shallow Hallowsphere forum remained open for several months. On 16 January 2016, the Shallow Hallowsphere forum was locked by VinnyVideo, who also removed the password protection in the three Hallowsphere forums. The Deep Hallowsphere appeared to be an incarnation of the PPP. It was flooded with topics soon after its clues were provided, most of the topics being utterly mindless. At some point, King Boo appeared and posted, hinting at a sinister purpose for the Hallowsphere. On the day of Halloween, it was revealed that Phanto had drawn MFGGers to his realm to claim their souls, using them to gain the power to become a god. All MFGG members who were not already killed by Wario, even the mainsite and forum administrators, were slain. It was believed by some that Phanto was a lackluster character and that his Hallowsphere did not compare to last year's event. Cap'n Coconuts in particular took great exception to Phanto's existence, initially parodying Phanto's clues and his entire existence in Super Mario Bros. 2. When Phanto paid little attention to his barbs, Cap'n Coconuts proceeded to make a hilariously hammy speech ridiculing Phanto's hints and challenging him to battle. The mockery continued as Phanto did little but write angry replies with increasing amounts of red text. Can of Nothing joined in on making a farce of Phanto and his domain, primarily by drawing parody comic strips. Alas, despite his valiant stand against this unwanted, unholy being, Cap'n Coconuts was no match for Phanto. 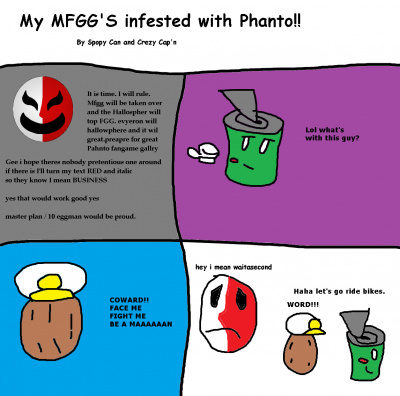 As Halloween approached, Phanto proceeded to steal the souls of every MFGGer on the forums and drew Cap'n Coconuts to the deepest part of his lair. With the power of all the souls of MFGG, he shed his mask and revealed his nightmarish true form, slaughtering Cap'n Coconuts before a fight could even begin. Phanto's plan was a resounding success, with no one left to oppose him. In spite of his complete victory in stealing the souls of everyone on MFGG, Phanto was not cut out for godhood and could not handle the stress of listening to all of MFGG's souls at the same time. Rather than buy a pair of earplugs, Phanto willingly gave up his godhood and released all of the souls he had stolen, each one gaining a second chance at life. However, because Cap'n Coconuts had angered him so greatly, his essence was cursed to take the form of an undying shadow, never to rest in peace. As he banished all the souls from his Hallowsphere, Phanto vowed that he would return, possibly to control the souls of MFGG once more. He also demanded a refund from Wario, implying that Wario was paid to assist with Phanto's plans. My MFGG'S infested with Phanto! !